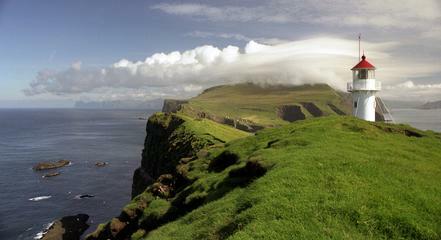 Mykines, long believed to be the Island referred to as “Paradise of Birds!” by the hardy Irish seafaring monk, St.Brendan in the 6th century during his sea-faring adventure in the North Atlantic. The perfect setting to take a deep breath and enjoy the calm, away from the rest of the world, to marvel at the rugged landscape, be fascinated by the antics of the Puffin colony that graces the island with its prescence every summer, or just to walk in the steps of theVikings! Our tour is the only Mykines Tour where we take care of you from departure to return - no need to worry about ferry tickets, local tourist tax payment website, lunch etc - all you need to do is turn up and we take care of the rest! On arrival at Mykines, we will give you a guided tour of the village and take some refreshments. Refreshed! 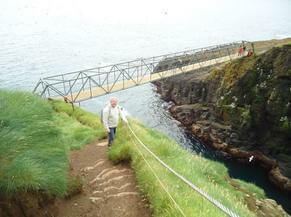 We will then take you on a guided walk to Mykineshólmur, which is connected to the main island by a wooden footbridge over a 35 meter deep gorge and ends with spectacular views from the lighthouse. We will be walking directly through the Puffin colony, so expect "close encounters of the bird kind" and many photo opportunities. 190 kr. per person each way.